Howdy everybody! Just wanted to pass along that I will be running the 'Poker for Beginners' panel at FCN. I am really looking forward to introducing poker to a new group of players. If you find yourself in need of entertainment at FCN around 3 pm Saturday, please stop by and say hi! It's always nice to see some familiar faces. If you can't make it out to the panel, I certainly hope to see you guys at the charity tourney later that evening! I've recently been hired at my local card room for a job that I've been striving to get for several years. As of this month, I am officially a professional poker dealer - certified, licensed, and employed. Being as this is the very beginning, I feel it to be the perfect time to begin tracking my progress and logging my most notable experiences. As a unique job type (and a very difficult one to get! ), I think that it might make for an interesting read. If not, well, I'm sure that at least I will look back someday and enjoy these memories myself. If you want to see more, check out my LiveJournal. Yes, yes, I know not too many people are gonna see this, but still. It seemed like the most logical place to post this. Well, with AC a week away I figure I'd put out one more call-out in case folks are interested in bopping on over to the Rivers for sit-and-go action at any point during the con. It seems like a fun idea to me, personally, and I haven't seen a brick-and-mortar place offer sit-and-goes before, so I'm certainly curious. Getting there is cheap even sans car, too. I also have another question. I'm sure many of you have played with Stevie or me in tournaments, and Stevie if you're around you could probably help with this. I'm looking to augment my chip set with more of the mid denominations, and some higher ones, too. I'd really like for them to be the same exact style and weight as the ones I have -- they're called "High Roller" (lol inorite) and they're the 11.5g mass chips. Problem is, everywhere I've looked, they appear to only be carrying around the lower value chips at this point -- 1, 5, 10, 25, 50, 100, and that's it. I'm looking for my second set to have some extra 500s and 1000s to allow for more coloring up if I help host larger tournaments (seeing as how I will have plenty of extra red, too, if things go the right way). If anyone finds a reasonably priced set of 650 with custom denom selection, or knows a good way to get a hold of said chips, please, good lord lemme know. I have wanted to do this for a while and it's starting to bug me! How the heck are we still hosting real-money tourneys on PokerStars if we can't play in real-money games in the US? We don't have that many international furs on here, do we? Just wrote a strategy article on exploitation in poker and how to find and fix your leaks. See below :) hope it's useful to some of you! The article focuses on heads-up play but it's applicable to other types of poker too. 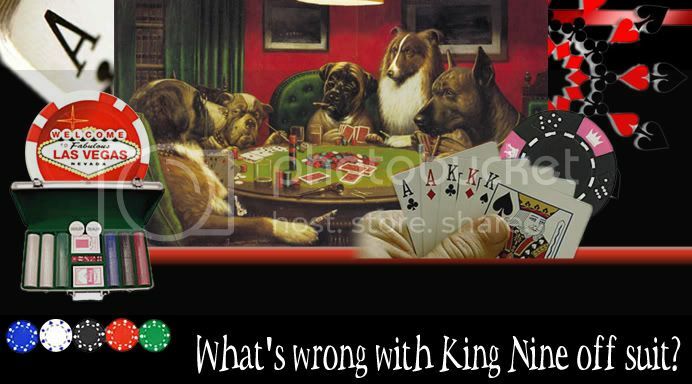 Feel free to watch me on FA as I'm sure there will be more poker goodness to come ^_^ . Hope some of you find it useful! Feel free to watch as I tend to post new poker journals semi-regularly ^_^ . I really want to play in this, but does anybody know when there might be other qualifiers and when exactly the final table will be? I really want to go to "FC: Unleashed" which is from 8-9:30 on Sunday night so hopefully the tournament will not conflict with that event as it's really popular and well attended. I'm a student of Phil Gordon, former Tilt Boy, and decided to needle a guy a bit, using my zen approach of honestly answering questions and validating my reasoning. When someone is a bit ticked, sometimes you can just stoke them til they burn themselves up. I think it worked to a point. then again, 3BB is pretty much insta-call so I'm not gonna brag about the knockout. I was dealt Qh-Th in the small blind with less than 10 big blinds. One person limped and it came to me, so i decided to take a chance and limp rather than raise, and just call the raise. well stiritup32 raised it well over 6x the big blind and I felt like he had a medium pocket pair or over cards. I knew I was underdog, but if he had a pair i could pull ahead on the flop or various other connections. If he has over cards, i'm either dominated or in a race to pair. taking my stack into account i decide to re-raise all-in, pray for a fold but accept a call and hope for the best. I'm short stacked and i need to gamble if i want to get myself back in. I don't usually needle unless someone attacks my strategy and calls it comepletely invalid, when there is, in fact, always a method to my madness. Congratulations to Anthony Tiger for taking the title. Alas my boyfriend took second again, and it was once again at the hands of a nine. OMG! So I'm 1 month into a rakeback account. HOLY CRAP WHY DIDNT I EVER DO THIS BEFORE! I'm getting back around 100/month! Only catch is you have to sign up for a NEW account for it to work. All I did was delete my fulltilt cookies and sign up for a new account with a new screen name and linked it to a new bank account... and it worked. I get 27% of all my rake directly back in my account... Best thing ever. Do you guys all have this? If you play any decent amount you HAVE to do this! Use the link below. I get like 1% on top of w/e you make if as a referral lol. It's probably nickels and dimes, but hey I like money. Even if you don't use that, you NEED to get a rakeback account somewhere! The top two from each will advance to the final table: Saturday, 8:00pm-10:30pm. I arrive in Denver at 9:30 Friday morning, so I estimate registration sheets will be going up around 11. HOWEVER, since it is a small tourney and space is limited, I am offering "pre-reg" for the pokerfurs community (I'm full of myself, I know). If you want to request sign-up for one of the qualifiers, leave a comment to this entry and I'll mark you down. There is a casino about 45mins away from the con called Indiana Live. This casino is on dry land and circumvents the law by using only machines with no live dealers. So they have $1/$2 No limit hold'em but it is on an electronic table. Still, anybody want to hit it up on Saturday 08/14/10, holla back. Rush poker has revived my bankroll :) Thank you Full Tilt... I love you. Ya'll should check it out. If you have a positive ROI, multiply it by 10xs per hour! Couple of drinks makes for a fun game.